“Let not many of you become teachers, my brethren, knowing that as such we will incur a stricter judgment” (James 3:1, NASB). 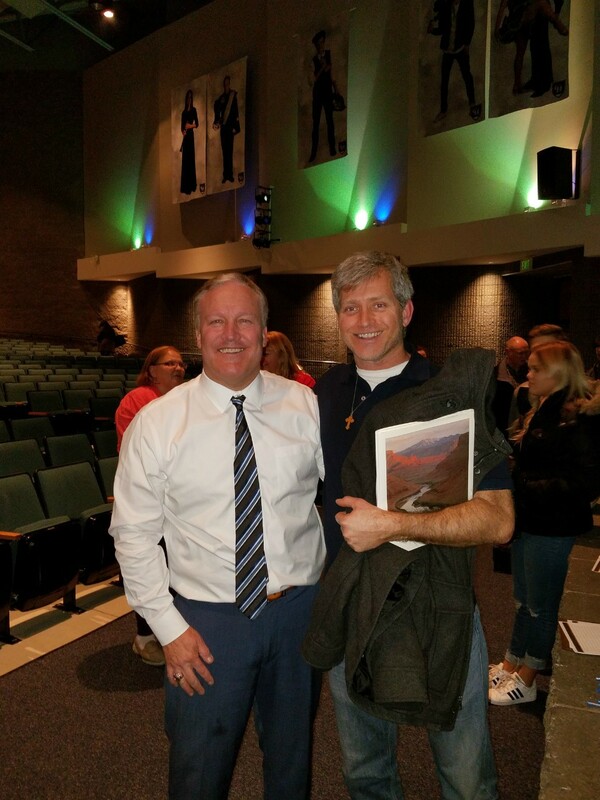 On January 29, 2018, a buddy and I went to go hear "Brother Scott" of The Book of Mormon Spiritual and Temporal Witnesses Presentation at Copper Hills High School, which is nearby where I live in West Jordan, UT. He is a self-appointed Book of Mormon apologist, who advocates the view that the Book of Mormon took place in Mesoamerica, and he has been going around giving presentations at well-attended high schools, LDS youth events, firesides, etc. I saw an advertisement last year in our local paper, but was unable to attend. I saw the ad again a few weeks ago, and decided to go see what it was all about. The presentation lasted around an hour and a half, and there were somewhere around 400 to 500 in attendance. Most of the evidences were reminiscent of the late LDS apologist Hugh Nibley, and were along the lines of there being no accessible knowledge of particular Mayan facts in the 1830s (the Book of Mormon came out in 1830), but all scholars confirm these facts today, so the only explanation Scott claimed is that these things had to have come from God. I took extensive notes, but it would have been nice to have recorded the event to make sure I got everything Scott went through rather rapidly in an hour and a half. At the outset, we were prohibited a few times from recording or even taking pictures. I was not very hopeful of having a meaningful conversation with Scott afterwards given that he was quite dismissive to the guy ahead of me who was pressing Scott on the Quetzalcoatl issue (more on that later). Scott said he had a lot of people to meet (which wasn't true) and to answer his question required a lot of info, so it would be better suited to send that to him over an email. Brother Scott with Rob SivulkaI wanted to ask about the elephant in the room, viz., why he wouldn’t tell us his full name. He wouldn't give it to me, since he didn't want it to be about him, but the message. Someone should give that memo to the general authorities! I told him, "Any doctor is going to list their name and credentials to check them out, so why can't we do that with you?" He assured me that I wouldn’t be able to search and find anything negative on his record, so I pressed him by asking why I should believe him. Again…, it's the message. Of course this smelled pretty fishy. If it was about the message, then why not at least get the message out more by allowing recordings so long as they didn’t disrupt the audience? Prohibiting them seemed more about protecting the person giving the presentation. Aaron Shafovaloff, of Mormonism Research Ministry as well as our board member for Courageous Christians United, was also there. He had a similar problem with Scott when he met him. Almost immediately, Scott played the “contention is of the devil” card with Aaron. Bottom line... Scott only will engage to a certain shallow extent, and then becomes quite defensive. The Department of Commerce, in response to a Salt Lake Tribune records request, said only one person, Kelly Scott, had sought to have his case files removed from the Internet. The division alleged in 2007 that Scott offered seminars to seniors promising them 7 percent returns on certain retirement investments, misrepresenting various aspects of the service. Scott, who actually lives just outside of Stephenson's district, agreed to pay a $100,000 fine, surrender his broker-dealer license until he is recertified, complete a series of continuing education programs, and provide refunds or settle complaints by customers (“Utah senator wants cases targeting brokers off the Internet,” December 21, 2012). Yes, “Kelly Scott” is a fairly common name, but I know they are the same, and I won't reveal my source. You can connect the dots yourself by examining his web pages. Utah is a prime market for fraud in the US. It appears Scott is still taking advantage of a gullible audience even though he wasn’t selling a thing. One of the other things that struck me as Scott being more of a used-car salesman than a scholar concerned his inflating the numbers of those who have attended his presentation over just the last couple years. 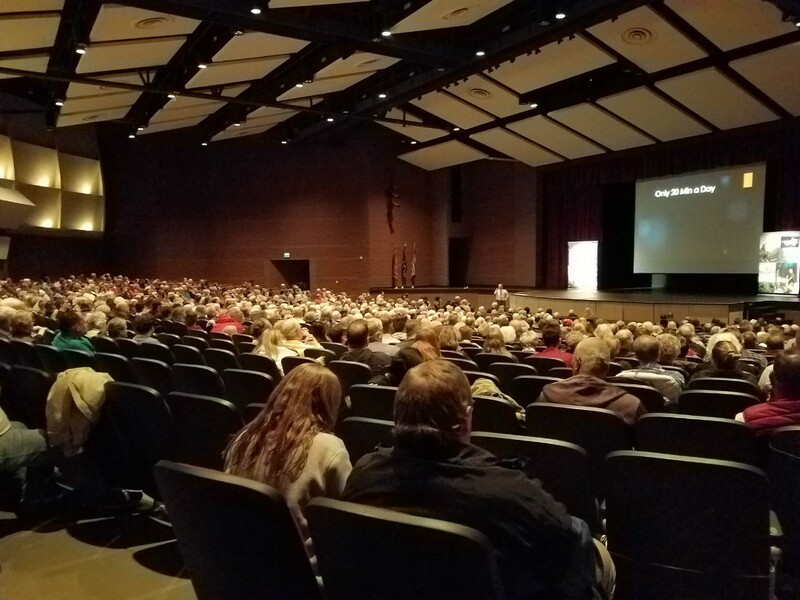 The ad in the paper from just around a few weeks ago said, “Over 12,000 people have seen this presentation.” At the presentation, just a week or two later, Scott said near the beginning that some 18,000 to 20,000 have seen it. Well 18,000 to 20,000 certainly is over 12,000, but that’s quite a bit over. Further, near the end of the presentation, he jumped the number up again to some 22,000! Given the crowd there last night, I believe a lot of people have seen it, but Scott bouncing the numbers continually upward didn’t help me take him seriously. At the beginning of the presentation, Scott admitted we don’t have complete scientific assurance regarding the location of the city of Zarahemla. He then put up a picture of the world with the Eastern and Western hemispheres. The former had the Bible and Jerusalem marked, and the latter had the Book of Mormon and Zarahemla marked in Mesoamerica. He then just used this as a working assumption for the rest of the presentation, using only evidence from a very limited geography. He basically dismissed any other views of where the events of the Book of Mormon took place (the other alternatives are North America, also called the Heartland view, and South America) for two reasons. First, the “vast majority” of LDS scholars are on his side, and second, he quotes the LDS founding prophet Joseph Smith in a September 3, 1842 Times and Seasons statement that says the “primary homeland for the Nephites was Central America.” Scott never dealt with any of the arguments put forth for any other view. Now even if Smith made this claim in 1842, he made other claims to show he was “all over the map.” Debate on this location topic can get quite heated in Mormon circles. One LDS apologist for the North American theory caricatures the Mesoamerican theory as “Mesomania,” and claims Smith never made that statement from the Times and Seasons (see his critique of Scott: “Mesomania for the youth...”). Michael De Groote in the Deseret News reported that “Joseph Smith made several statements that can be interpreted to have geographic implications. Proponents of a North American setting see these statements as authoritative and based in revelation. Mesoamerican theorists think that Joseph Smith's ideas about geography expanded over time and included approval of at least some connection to Central America” (“The fight over Book of Mormon geography,” May 27, 2010). This limited geography theory of Mesoamerica has never been taken as the official position of the Church. In fact, they have never taken an official position at all, and if the evidence is as compelling as Scott made it out to be, one would think they would have officially declared his theory the winner. Despite all this, not only has Zarahemla never been found and accepted by any scholar, neither has the Hill Cumorah. However, at least the Heartland theory has Smith claiming to have unearthed the gold plates in a stone box in New York, not in Mesoamerica. We all know where New York is even if we have never found this supposed stone box with gold plates. According to the Book of Mormon, the place where the plates were buried is the same place where a massive war took place. One would think everyone there at Scott’s presentation would have wondered how in the world that happened if a Mesoamerican theory really is what should be believed. This isn’t to say that answers couldn’t be given, but none were forthcoming from Scott, and that’s indicative of shallowness. A mile wide and an inch deep as the saying goes. One may have been personally impressed by what Scott presented, but no scholar (even LDS) would take his presentation seriously. With all this in mind, it shouldn’t surprise one to find out that Brother Kelly Scott next states that the #1 evidence for the Book of Mormon is the peaceful feelings that come from knowing the doctrines of the Book of Mormon. He said, “The only way is through the witness of the Holy Ghost.” The burning in the bosom becomes the trump card. 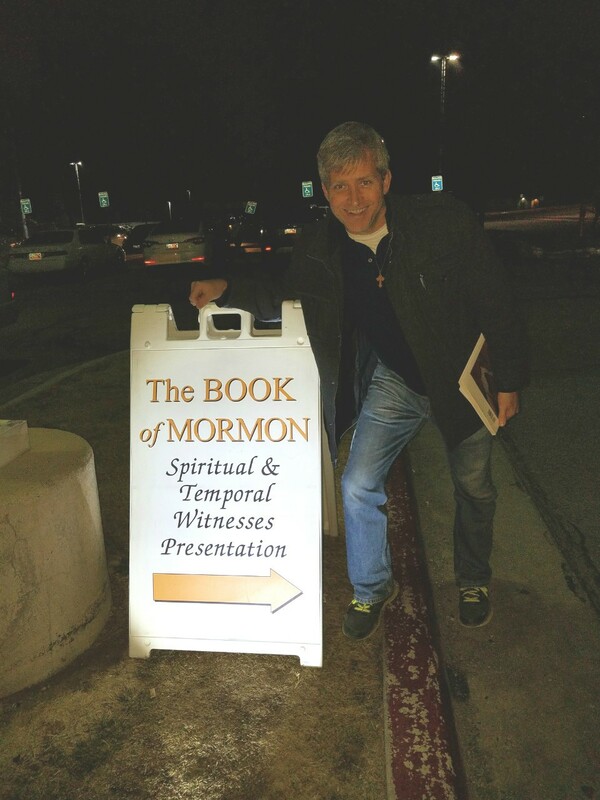 Scott described his 18-hour long search one time when he was around 18 years of age, which culminated in him loving the Book of Mormon and not being able to get enough of it. The basic problem with this, though, is that the doctrines are wrong despite whatever feeling one may get from them. For example, white-supremacy or racism is clearly taught in the Book of Mormon. Here, God curses some with dark skin to keep them from interbreeding with the righteous white skin folks, and then as the former repent, their curse is taken from them and they get white skin (e.g., Alma 3:6ff. and 3 Ne. 2:14-16). This doctrine doesn't bring a peaceful feeling to most modern readers. Or how about the feeling one gets from reading 1 Nephi 14:10: “Behold there are save two churches only; the one is the church of the Lamb of God, and the other is the church of the devil; wherefore, whoso belongeth not to the church of the Lamb of God belongeth to that great church, which is the mother of abominations; and she is the whore of all the earth”? So if the readers don’t get that peaceful feeling from these doctrines, does that mean the Book of Mormon isn’t true? According to Scott and the rest of the Mormons, probably not. In addition to this, it is not difficult to see how Mormons and others can latch onto positive and/or well-accepted doctrines found in the Book of Mormon. This is particularly the case when the Book of Mormon plagiarized quite a bit of the Sermon on the Mount, for example, which Scott just happened to use quite a bit near the end of his presentation (cf. Robert M. Bowman Jr., THE SERMON AT THE TEMPLE IN THE BOOK OF MORMON: A Critical Examination of Its Authenticity through a Comparison with the Sermon on the Mount in the Gospel of Matthew). Those who already have a familiarity and acceptance with the Bible on some level are more disposed to the familiarity and acceptance of the Book of Mormon due to all these apparent plagiarisms. Scott quotes the scholars of Joseph Smith’s time—William Robertson and George Bancroft—who claimed that wood and cement cities were not true for ancient Americas. However, it turns out that now all scholars believe this is the case. So this is an archeological evidence for the Book of Mormon’s veracity, which talks about many houses of cement as well as wood and cement cities (Helaman 3:7, 9, and 11). Scott led the audience to think Robertson and Bancroft were referring to anywhere in the Western hemisphere, and particularly in Mesoamerica. Fortunately, the LDS apologist for the Heartland theory mentioned above has a photo of the picture Scott used, and it clearly says the reference from Bancroft was to “North America,” not Mesoamerica. Scott’s use of Robertson doesn’t give an exact quote, but the picture shows Scott said the “Americas” even though Robertson’s book is given as “History of America.” Given that’s the title, it is incumbent on Scott to give the exact quote so we can verify that Robertson was indeed talking about the “Americas” rather than “America.” Again, Scott isn’t a scholar, and doesn’t seem to care for precise details. Nonetheless, if the LDS Church ever ends up taking the Mesoamerican view as their official position, then how do we explain Smith’s use of “cement” when there was apparently no knowledge of that in Mesoamerica until after Smith? Simply based on the two sources on America that Scott used, I am not convinced that asserting there was some type of cement used in Mesoamerica would have necessarily been thought to be an anachronism to an 1830s’ audience. Scott needs to demonstrate that everything we knew outside of the Book of Mormon back in 1830s would rule out a cement being used in Mesoamerica. Throughout history, long before Joseph Smith, there have been various types of cement used. Even “Joseph Aspdin took out a patent in 1824 for ‘Portland Cement’" (“Cement History,” Understanding Cement: Interpreting Cement Science Since 2005, emphasis added). Although perhaps not common knowledge, we have known about the structures in Mesoamerica since the Spanish arrived. Given what we know of Smith using the King James Bible and likely Pastor Ethan Smith’s View of the Hebrews as just a couple sources for the Book of Mormon (cf. Jim Day, "3. Joseph's Plagiarism in Book of Mormon and Other Revelations," 20 Truths about Mormonism), there should not be any difficulty in Smith incorporating a well-known substance like cement into descriptions of Book of Mormon’s buildings. This is not to say that these sources use the term “cement,” since they don’t. However, it is to say that Smith was creative enough to take liberties and add descriptions as he saw fit, and I don’t see anything at this point that would convince me that some type of cement was not thought to be used in these Mesoamerican structures back then (critics notwithstanding). There is quite a difference between the confirmatory evidence of cement and the confirmatory evidence of finding Zarahemla or any other place mentioned in the Book of Mormon New World, to give just one example. As a result, I don’t see why this cement issue should be a big of a deal as some Mormons make it. In 1904, Edward Herbert Thompson dredged a cenote and found, among other things, a small number of gold plates with Mayan pictographic and hieroglyphic writing on them (“Ancient gold plates in Mesoamerica,” Deseret News, April 39, 2011). So Joseph Smith’s claim of gold plates doesn’t sound as farfetched as once thought. However, the Bible clearly states: “And thou shalt make a plate of pure gold, and grave upon it, like the engravings of a signet, Holiness To The Lord” (Exodus 28:36). Aaron the priest was to wear this on his forehead. Certainly this wasn’t a book, but several chapters later we are told about tablets of stone that are engraved upon (Ex. 32:16). Add to this B. H. Roberts’ question concerning what View of the Hebrews describes as digging up four folded dark yellow leaves with some Hebrew Bible writings on them in Pittsfield, MA. At this point, it doesn’t take much effort to see that Smith’s imagination took over to form the gold plates of the Book of Mormon. Further, even if this means of writing on metal wasn’t common knowledge, Mayan hieroglyphics are one thing; finding Reformed Egyptian hieroglyphics are quite another. Similarity doesn’t entail identity. The former don’t look like anything written on the manuscript Martin Harris took to Professor Charles Anthon… if that’s what Reformed Egyptian really looks like. We have around 6,000 early manuscripts of the Koine Greek New Testament. However, we are still waiting for just one ancient Book of Mormon of manuscript to be found regardless of the means it was written on. One would think that among all the great civilizations that were supposedly settled here from the Eastern hemisphere, we would find some ancient manuscripts--metal or otherwise--containing these precious truths of scripture from the New World prophets. A pre-Columbian stone box was discovered in Mesoamerica in the late 19th century, and its description sounds similar to the supposed box that contained the supposed gold plates (Paul R. Cheesman, "Ancient Writing on Metal Plates," Ensign, October 1979). How would Joseph Smith have access to this knowledge? Suppose a leading character in Israel—wherever they are—should be found to have in his possession some biblical fragment of ancient Hebrew writing. This man dies, and it is buried with him in such a manner as to be long preserved. Some people afterward removing that earth, discover this fragment, and ascertain what it is—an article of ancient Israel. Would such an incident… be esteemed of some weight? Something like this may possibly have occurred in favour of our Indians being of Israel (217). Then a couple pages later it begins talking about unearthing the inscribed dark yellow leaves I mentioned in the preceding section. These leaves encased in “some hard substance,” which prior to opening, were thrown into “an old tool box” (219). A Mr. Merrick takes 3 of the 4 leaves to a Mr. Sylvester Larned, who verifies they are Hebrew scriptures (220). It goes on to describe the phylacteries that preserved these leaves as “boxes or rolls” (220). Then a celebrated Jewish preacher, Rev. Mr. Frey, explained the Jewish “custom of burying their leaves of phylacteries when worn out and illegible; as they had also any old leaf of a Hebrew bible. They would roll it up in some paper, and put it under ground from respect” (221). Now perhaps I’m being a little too imaginative, but this sure sounds like something that can easily be converted into Smith’s story. He unearths a sacred text of gold plates from a box, and then goes to get it verified by a learned (Larned) man! Having said that, it doesn’t seem like the stone boxes in Mesoamerica are all that similar to Smith’s intentionally buried stone box. It’s not clear that the former were used to bury items even though after all these years they unsurprisingly ended up being buried. The items in these boxes were masonry tools, jewelry, and textiles. Smith’s stone box was intentionally buried to preserve sacred scripture. So I really am not sure how much of a big deal it is that both boxes are just made of stone. Scott next claims that the writings of engraved stones of the Olmecs and Mayans demonstrates that without the aid of the supernatural, Smith would not be able to know that they had a written language when the Book of Mormon says in Omni 1:20 that there was a large stone that had engravings on it. Scott offers a drawing of a stele from Quirigua, Guatemala that dates to 761 A.D., and it has hieroglyphs on it. The time frame of the Book of Mormon ends in 421 A.D., so pointing to something Mayans had a few hundred years later only makes sense if one begs the question that the Mayans are in fact the descendants of the people the Book of Mormon describes. Are there other possibilities? We know the Bible talks about engravings on tablets of stone (e.g., the 10 Commandments) or engravings on two stones (Ex. 28:9-12). Job 19:24 talks about engraving in a rock. Zechariah 3:9 talks about engraving a rock with seven eyes and an inscription. It seems more likely that Smith incorporated a similar story into the Book of Mormon from the Bible. That quote was funny, since it reminded me of how Smith claimed to know what life was like on the moon (e.g., the people were on average about 6 feet tall and dressed like Quakers). Even if Smith was exaggerating stories for children, it shows how good Smith was in telling stories. Again, the Bible talks about highways in various passages. In fact, the highways of the Lord would be raised up or exalted in Isaiah 49:11. The King James Version of Isaiah 62:10 tells others to “cast up” the highway. Alma 49:4 says, “[T]he Nephites had dug up a ridge of earth round about them, which was so high that the Lamanites could not cast their stones and their arrows at them that they might take effect, neither could they come upon them save it was by their place of entrance.” These have been found in Mesoamerica, so again, Scott asks how else could Smith know. Reading this Book of Mormon passage immediately ought to remind one of the fortified city of Jericho. The Israelites needed divine aid to come against that city. forts, cemeteries, temples, aitars [sic], camps, towns, villages, race grounds, and other places of amusement, habitations of chieftains, videttes, watch towers, and monuments. …situated in the midst of savage tribes from their race. …Thus situated, and struggling to maintain their existence, and to maintain their religious traditions, they would naturally form… walled towns, forts, temples, altars, habitations of chieftains, videttes, and watch-towers. …[S]tated in relation to these two branches of the descendants of Israel” (189). It goes on to talk about fort walls at one location being 10 feet high (190), and then another fort having “walls from twenty five to thirty feet in height” (191). Scott next pulled out this Mayan term utchi, which he said translates “and it came to pass.” Again, Scott concludes the only way Smith could know this knowledge is if God revealed it to him. The LDS North American theory proponent mentioned earlier shows the slide Scott used, which says, “Joseph Smith… translated the hieroglyphic Utchi into English ‘and it came to pass’ ‘1382 times’” (“Mesomania for the youth…”). Then this blogger says that “Mayan has nothing to do with Hebrew or Egyptian.” The Book of Mormon was supposedly written in a form of the Egyptian, not Mayan. Again, similarity doesn’t prove identity. Basically every language has a way of speaking about “and it came to pass” or “and it then happened,” so the only thing special about the Mayan use is due to the fact that certain Mormons already have a bad case of Mesomania. It must be what the Book of Mormon speaks of and all things get incorporated into this way of thinking! Further, the example Scott used of utchi was listed with specific dates found on a temple. This isn’t the way the phrase is used in the Book of Mormon. There, the phrase is not tied to any specific dates. The author labored to give his words and phrases the quaint, old-fashioned sound and structure of our King James’s translation of the Scriptures; and the result is a mongrel—half modern glibness, and half ancient simplicity and gravity. The latter is awkward and constrained; the former natural, but grotesque by the contrast. Whenever he found his speech growing too modern—which was about every sentence or two—he ladled in a few such Scriptural phrases as ‘exceeding sore,’ ‘and it came to pass,’ etc., and made things satisfactory again. ‘And it came to pass’ was his pet. If he had left that out, his Bible would have been only a pamphlet (Ibid.). Scott next quotes Mosiah 2:9 to show that the scriptures were unfolded to the people. Well it just so happens that they found Mayan records that were folded like an accordion. Again, how would Smith know? And these are the words which he spake and caused to be written, saying: My brethren, all ye that have assembled yourselves together, you that can hear my words which I shall speak unto you this day; for I have not commanded you to come up hither to trifle with the words which I shall speak, but that you should hearken unto me, and open your ears that ye may hear, and your hearts that ye may understand, and your minds that the mysteries of God may be unfolded to your view. This is the exact same meaning that Psalm 119:30 has when it says, “The entrance of thy words giveth light; it giveth understanding unto the simple.” Other versions of this passage use the same term Mosiah 2:9 uses: “unfolding.” No one assumes that it is referring to an accordion Bible. Kelly Scott claimed that most scholars up until the 1950s claimed that the ancient Mesoamericans were peaceful. Since then, discoveries have shown the people to be quite warlike. Scott quoted Alma 24:13, which talked about blood-stained swords. If they were of some sort of metal, there would be no way they could be stained. The blood is easily washed off. Only a wooden sword that absorbs the blood can be stained, and modern discoveries have confirmed that the Mayans had these types of swords. So again, how would Smith know? First of all, again, if Smith could make up stories of people on the moon, then he was also very capable of making up stories of the ancient inhabitants of the New World. This should be rather uncontroversial, and it should also be uncontroversial that the ideas of war and swords from other sources can easily be incorporated into his Book of Mormon story. The Bible and View of the Hebrews both have many such descriptions. Second of all, Alma 24:13 seems to be clearly speaking in metaphorical language. It says, “Behold, I say unto you, Nay, let us retain our swords that they be not stained with the blood of our brethren; for perhaps, if we should stain our swords again they can no more be washed bright through the blood of the Son of our great God, which shall be shed for the atonement of our sins.” If Scott wants to apply a literal meaning here to the swords being stained, then he would have to apply the same literal meaning for what the verse goes onto say about those swords being “washed bright through the blood of the Son.” Staining the sword is metaphorical language for putting someone to death with a sword. This is simply a common way of talking even today. For example, Louis Cha has a novel called Sword Stained with Royal Blood. No one would think that Cha was talking about some type of wood club. At this point in the presentation, Scott begins to offer even more improbable evidence of symbols, allegory, and even legend. Basically, one really needs to strain even more to see the hidden truths contained in the Book of Mormon through all the pagan distortions down the road. Scott’s narrative is that it is obvious the ancient pagan Mesoamericans’ theology had apostatized from where it should have been. They had the basic form at one point, but it had become distorted, and Joseph Smith would only know all this via revelation from God. 2 Nephi 2:7 says that Christ came as a sacrifice for sin to the broken hearted and those of a contrite spirit. From that, Scott and certain other Mormons see that the immigrants from Israel were “broken” up into various group. Further, brokenness is symbolic of apostasy. The Lamanites fell away from or had broken the truth that was already given. This is exactly what is seen in the polytheism of the Mayans. They had forsaken the knowledge of the one God (cf. Alma 33:1), who is the “Great Spirit” (Alma 18:18). Mayans had even their kings as gods, and the truth of a broken heart was later distorted in a literal way of ripping hearts out of people in sacrifice to their gods. Scott juxtaposed this polytheism with a Book of Mormon monotheism. Nothing was ever mentioned of Mormonism itself teaching polytheism in Scott’s presentation. Nothing was ever mentioned, since the Book of Mormon never says there is more than one true God. In fact, any other true God is specifically denied in Alma 11:24-29 and 18:5. The type of monotheism taught in the Book of Mormon was a specific type of modalism, which denies a distinction of persons within the Godhead and teaches there is only one divine person with expansionistic titles or ways of appearing (cf. Ronald V. Huggins, "Joseph Smith’s Modalism: Sabellian Sequentialism or Swedenborgian Expansionism?," Mormons in Transition). However, in reflecting Joseph Smith’s evolving theology, other LDS scriptures clearly teach polytheism (cf. D&C 132 and Abraham 4-5). The problem is that Scott is not coming clean that Mormonism is also polytheistic. So if Scott were to be more precise and forthcoming, he would have claimed that Mayan polytheism is a distortion of the polytheism Mormonism espouses. Regardless, Scott goes on to demonstrate the corruption of Mesoamerican doctrine. The call in Mosiah 2:10 and Alma 18:34-35 is to acknowledge the difference between a mortal man and God. The pagans wondered if the prophets were God or the Great Spirit. The men of God brought forth correction, telling them that the prophets were mere men, who simply had a portion of the Spirit of God. It is obvious to Scott that these Mesoamericans had some form of the doctrine of resurrection as well. The King Pakal’s sarcophagus demonstrates that he would be reborn from the tree coming out of his chest and growing into the sky. Alma 14:8 claims the people had “records which contained the holy scriptures.” The believers and these scriptures were burned in the fire. Without the scriptures, corruption increasingly happened. Scott then played the famous John 10:16 card of “other sheep I have that are not of this fold.” Mormons believe this refers to the people in America. But why stop there? The logic would seem to indicate that there would have to be other resurrection appearances of Jesus in such places like Australia. Perhaps, but LDS know about Christ’s appearance in America because of the Book of Mormon. The last gem Scott brought up was Quetzalcoatl. This Mesoamerica legend taught that he was an international God of peace, who promised to return someday. The Mesoamericans assumed the Spanish explorers were from heaven, and that Cortez was Quetzalcoatl—the great white bearded God. This also implies that the Mesoamericans had a rudimentary belief in Jesus Christ that had become distorted through the centuries. We have already seen the groundwork structure for the Book of Mormon story of two divided houses of Israel here in the New World via the View of the Hebrews. Add to this the distortion story of Paul and Barnabas being regarded as gods in Acts 14:11ff. They told the people they were men just like them. In addition to this, given what Romans 1:18ff. says, God has given a knowledge of Himself in the things that are made so that mankind is without excuse. They became futile in their thinking, their foolish hearts were darken, and they became idol worshippers involving themselves in all sorts of impure practices. However, no supernatural aid is required to pattern all this into a New World novel. As for the King Pakal sarcophagus, this doesn’t entail that the origin was from a time when the Christian doctrine of resurrection was preached. Since God has put eternity into the human heart (Ecclesiastes 3:11), it should not surprise us to find similar stories around the world of being reborn in the afterlife. There is a lot of conjecture as to the precise nature of the Mesoamerican theory of the afterlife. As for John 10:16, if the other sheep Jesus had were not of the fold He was talking to, then it doesn’t seem likely that He was referring to the Book of Mormon peoples, since according to the story, they were of the same fold. They were all Jews. This is why it seems better to understand Jesus referring to the unfolding mission to the non-Jews (i.e., the Gentiles), clearly seen in the first book of Church History—Acts. And as Acts 1:8 indicates, the disciples would take the gospel message from Jerusalem, in all Judea, Samaria, and to the ends of the earth. Whether Quetzalcoatl can tell us anything about the Book of Mormon, however, remains unproven. FairMormon does not at present recommend relying on this as ‘evidence’ for the truth of the Book of Mormon account. …Despite the enthusiasm of some earlier researchers, the Quetzalcoatl as Christ link has substantial problems. Chief among these is the fact that most writers have not used the original sources of the Quetzalcoatl myths, but have relied on secondary sources—these sources often came via the Spanish, who likewise had an interest in seeing Christian parallels with native Amerindian myths. When the original sources are studied, it becomes clear that the Christian parallels to Quetzalcoatl are not as significant as some authors have previously thought (“The potential relationship between Quetzalcoatl and Jesus Christ,” FAIRMormon). There are problems with his view. 1 Nephi 3:7 says, “I will go and do the things which the Lord hath commanded, for I know that the Lord giveth no commandments unto the children of men, save he shall prepare a way for them that they may accomplish the thing which he commandeth them.” This seems to say that God doesn’t give you a command that He doesn’t expect you to keep. In other words, ought implies can. If one is told they ought to stop cheating on their taxes, then that implies that one can stop cheating on their taxes. It makes no sense to tell a kid he ought to jump to the moon. So if we ought to obey all the commands, then it seems pretty straightforward that we can obey all His commands. Similarly, Jesus tells the woman caught in adultery, “Go and sin no more” (Jn. 8:11). Again, if she ought not to sin, then she can do it. However, we also know that God is patient and knows we are all going to fail. Similarly, we give commands to our kids, which we know they can keep, but we know it may take some good trying and failing a number of times before they get there. I tell my daughter to memorize a big passage of scripture. She can do it and I expect her to do it, but I know it’s going to take a while. “Practice makes perfect” I like to tell her just as my dad used to tell me. So God prepares the way to accomplish the commands and expects them to be kept, but not even He expects instant perfection. The problem with this, though, is that we can understand certain children failing and being excused, but at what point do we say that there is no excuse and we should have done something we didn’t do or we should have not done something we did do? After a lifetime of trying, older adults are still a long ways from perfection. Everyone dies a sinner who struggles with certain things. What about the end of D&C 46:9, “and him that seekth so to do”? Seeking to do something is not necessarily the same thing as seeking or trying to do something with the understanding that failure will result. The context of this passage reveals in verse 14 that eternal life is given to those who “continue faithful.” Hypothetically, one may keep the commandments and not seek to do so, since that is just how one is programmed. So the verse is saying that it is not just those who keep the commandments, but those who seek, try, or intend to do so. The heart must be there, and the commandments are kept. So in a certain sense Scott and Holland are right. One does get credit for trying, but not in the sense that Scott and Holland seem to be implying. The trying that has merit is the one that must accomplish what it sets out to do. 46:9 never says, “For those who keep the commandments and those who don’t keep them, but simply seek to do so.” It simply says that one must keep them, and seek to do so. In fact, LDS Prophet Spencer W. Kimball stated the matter of trying with sinning very clearly when he said under the section of “Trying Is Not Sufficient,” “It is normal for children to try. They fall and get up numerous times before they can be certain of their footing. But adults, who have gone through these learning periods, must determine what they will do, then proceed to do it. To ‘try’ is weak. To ‘do the best I can’ is not strong. We must always do better than we can” (The Miracle of Forgiveness, 164-165). He also went on to teach, "This progress toward eternal life is a matter of achieving perfection. Living all the commandments guarantees total forgiveness of sins and assures one of exaltation through that perfection which comes by complying with the formula the Lord gave us. ...Perfection therefore is an achievable goal" (Ibid., 208-9). For Kimball, true repentance is a perfected process of not only faith, but sorrow, confession, restitution in so far as possible, and total abandonment of sin (including any urges to sin) in keeping the commandments. "The forsaking of sin must be a permanent one. True repentance does not permit making the same mistake again" (Kimball, Repentance Brings Forgiveness) and it "spreads to all areas of [one's] life" (Teachings of Presidents of the Church: Spencer W. Kimball, 43). Thus "the repentance which merits forgiveness [is such that] the... transgressor must have reached a 'point of no return' to sin wherein there is not merely a renunciation but also a deep abhorrence of the sin–where the sin becomes most distasteful to him and where the desire or urge to sin is cleared out of his life" (Ibid., 354-5). [D]o not procrastinate the day of your repentance until the end; for after this day of life, which is given us to prepare for eternity, behold, if we do not improve our time while in this life, then cometh the night of darkness wherein there can be no labor performed. Ye cannot say, when ye are brought to that awful crisis, that I will repent, that I will return to my God. Nay, ye cannot say this; for that same spirit which doth possess your bodies at the time that ye go out of this life, that same spirit will have power to possess your body in that eternal world. For behold, if ye have procrastinated the day of your repentance even until death, behold, ye have become subjected to the spirit of the devil, and he doth seal you his; therefore, the Spirit of the Lord hath withdrawn from you, and hath no place in you, and the devil hath all power over you; and this is the final state of the wicked. The basic problem for Scott and Mormons in general is that no non-Mormon anthropologist holds that the ancient Mesoamericans, or any ancient Americans for that matter, were of Hebrew origin. Their ancestry is commonly thought to be Asian. All DNA evidence on the matter validates this. Given the vast Book of Mormon civilizations and the people being described as numerous as the sand of the sea (Mormon 1:7), one would think that some DNA evidence would yield a Middle Eastern origin prior to Columbus. Nothing! We have found all sorts of evidence of ancient Mesoamericans, but we still have nothing compelling to believe in the existence of Jaredites, Nephites, or Lamanites. Even a broken clock is correct twice a day. Smith’s ability to get it right on using cement or stone boxes, for example, beyond what apparently could be naturally lifted off various sources, at least points to his natural creativity. However, it may point to something more. Given Smith’s involvement with the occult, including his practice of peep stone gazing, his fascination with the dead and working for their salvation, and his Jupiter talisman he was wearing when he died (cf. D. Michael Quinn’s Early Mormonism and the Magic World View), as a believer in the supernatural, I also hold that Smith had demonic creativity. Demons know a lot more natural knowledge than Smith had access to. The Bible is clear that even false prophets can give signs and wonders (Duet. 13:1-2 and Mat. 24:24). Even so, those prophets are unreliable, whereas the Bible is reliable, and according to Jesus, it “cannot be broken” (Jn. 10:35). The Mormon criteria for determining the veracity of Joseph Smith isn’t what the Bible prescribes. The Bible has long ago given us this these criteria, because God knew that false prophets would always try destroying the flock. The Bible teaches 1) if they teach other gods (Deut. 13:1-5), 2) if they give false prophecy (Deut. 18:21-2), and 3) if they have bad fruit (Mat. 7:15-20), then they aren’t of God, regardless if they can provide an item of knowledge no one else is aware of at the time. By getting one’s focus on the sign and excluding these biblical tests, one is acting wickedly and opening oneself to being influenced by demons. Jesus taught, “A wicked and adulterous generation seeks after a sign” (Mat. 16:4). Not only are all these external evidences for the Book of Mormon forms of a sign, so also is the whole praying for a testimony to see whether the Book of Mormon is of God. For Mormons to continue their fascination over signs, it’s no wonder they are lost and in need of the Truth. He alone can set them free from their darkness. As scripture says of them, they are “ever learning, but never able to come to the knowledge of the truth” (2 Tim. 3:7). 1) SECURITIES FRAUD ...BY MISREPRESENTING AND OMITTING MATERIAL FACTS IN A PRESENTATION TO POTENTIAL INVESTORS; 2) SECURITIES FRAUD ... BY USING UNAPPROVED SEMINARS, ADVERTISING, AND SALES MATERIALS, WHICH CONSTITUTES AN ACT, PRACTICE OR COURSE OF BUSINESS WHICH OPERATED AS FRAUD; 3) DISHONEST AND UNETHICAL BUSINESS PRACTICES ... BY USING MISLEADING OR DECEPTIVE SALES PRESENTATION AND BY VIOLATING NASD CONDUCT RULE 2210.